talkhealth > Blog > 2015/08 > FreeFrom things we’d love but never get! The FreeFrom Eating out Awards are in progress so if you are a food service company you still have a week or so to enter. You can do so online here: . Each year we meet to judge the entrants for foods suitable for food service and the quality just keeps on getting better and better. Apart from a huge loading of carbs because most of the products seemed to err on the side of carbohydrates, there were some fantastic products to review. Beer, no tasting is ever really complete without some gluten free beer – always a treat. But what about the things we would love to see but never do. Here are a few ideas that came to me. Every hairdressers seems to have them, those sawdust biscuits that come out with your tea or coffee. I do believe they might be dairy free but they do contain wheat so I can’t touch them. Now I don’t want to do Lotus out of business, they seem to have the monopoly on hairdressers and coffee shops but there are far nicer things to pop in the saucer. There are loads of lovely wheat free, dairy free and nut free biscuits out there. Sadly not many biscuits were entered into the foods for food service category. Two biscuits in a prepacked serving would be perfect for hairdressers, hotels, cafes etc. And while we’re on the subject of biscuits, what about cookies. Now if I can make them then I know the food manufacturing industry can. It’s not hard to make wheat, dairy and nut free cookies. PS. I love this photo. 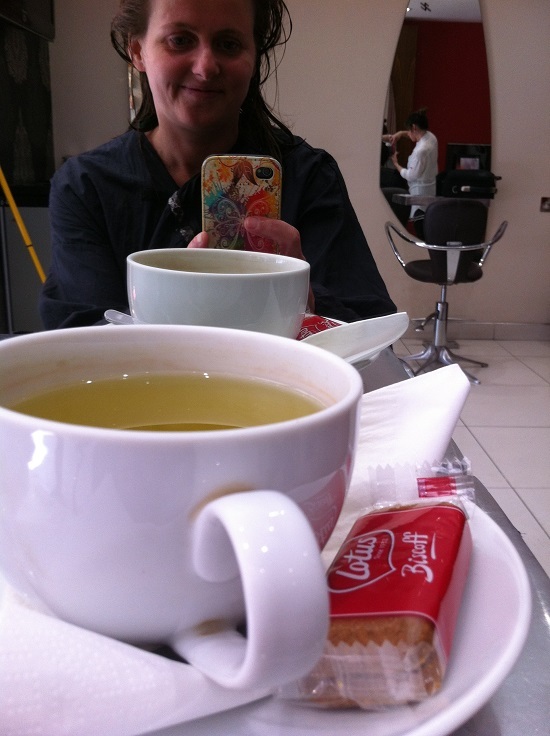 The moment before I got all my hair cut short, and you can see someone else behind having their hair cut too! This is a big ask, I know. But every hotel has tea bags, coffee sachets (ghastly), sugar and those UHT milk portions. I dream of the day I turn up to find a cafetiere, fresh coffee and some dairy free milk, oh and perhaps a pack of ‘Nairns oats and syrup’ oat cakes. Maybe some herbal tea sachets too. Having issues with tomatoes, I can’t eat them or my skin swells and burst and liquid comes out. I know, very odd. But many of the products which are dairy free are either soya based (no good, allergic to that too) or have tomato instead. Not great for me. What about red pepper based sauces? It works just as well and would make a tomato intolerant allergy blogger very happy. I often make my own tomato free red sauce with lots of red stuff like sweet potatoes, carrots, beetroot and red peppers which once cooked and whizzed down makes a great replacement red sauce. Don’t just have soya milk – some of us are allergic to that too! Many coffee shops offer soya milk but few have any other plant milk alternatives. I know some of you do so thank you The Perfect Retreat in Chesham and PrintWorks Kitchen in London. This is not likely to happen but I would rather like to hear that the Daily Mail have, for once, properly researched an article and printed something respectful and accurate about allergies and coeliac disease. In a week which has seen the Daily Mail write about gluten free doughnuts and battenberg being available free on NHS prescriptions – something which is definitely NOT the case, I can assure you, is it too much to ask for a bit of respect? Why do none of the supermarkets near me stock Coconut Collaboratives ice cream? or Pudology puddings? or Mozzarizella dairy free cheese? or BFree Wraps – where have these gone to? Did I dream them up at the show? They were so amazing but never seen again, not least from their own website. What would you love to see happening that isn’t? What do you crave that isn’t readily available?